In 1754, the celebrated actor David Garrick purchased Hampton House (now Garrick’s Villa) which overlooks the river Thames at Hampton. He commissioned Robert Adam to improve the house, adding a classical portico and orangery. 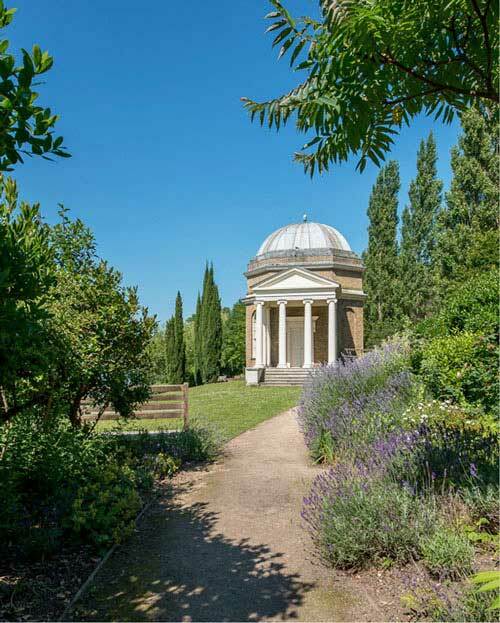 At some point in 1755 he decided to build a garden folly by the riverside which he intended to dedicate to his muse Shakespeare as a ‘temple’ to the playwright whose works he had performed to great acclaim throughout his career. Garrick used the temple to house his extensive collection of Shakespearean relics and for entertaining his family and friends. The temple now houses an exhibition about Garrick himself, featuring a number of reproductions of works by major 18th century artists, including Gainsborough, Reynolds, Hogarth and Zoffany. The temple was built in the Classical style popularised by the Italian architect Palladio with an Ionic portico, four columns wide by three deep, flanking the entrance. Several steps lead up to the portico. The temple's architect is unknown as Garrick’s decision to build it is not recorded in his own papers. Robert Adam and Lancelot ‘Capability’ Brown have both been suggested as possibilities. 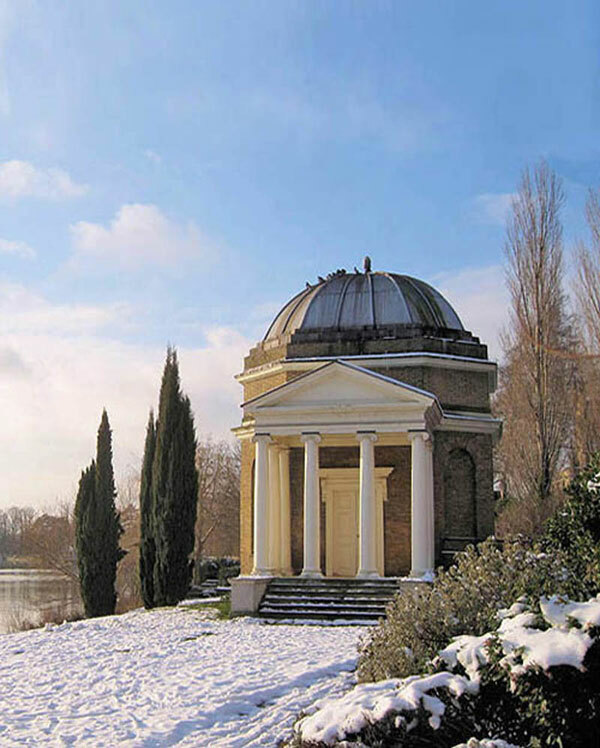 An ‘Ionic Temple’ of similar design stands in the gardens of Chiswick House a few miles away. This may well have been the inspiration for Garrick's Temple, Garrick had spent his honeymoon with his wife Eva Maria in June of 1749 at Chiswick House, home of Lord and Lady Burlington. The Burlingtons were close friends of the Garricks and had acted as guardians to Eva Maria before the wedding. Quod spiro et placeo, si placea, tuum est. To preside over the interior of the Temple, in 1758 Garrick commissioned a life-sized marble statue of Shakespeare from the eminent Huguenot sculptor, Louis François Roubiliac. 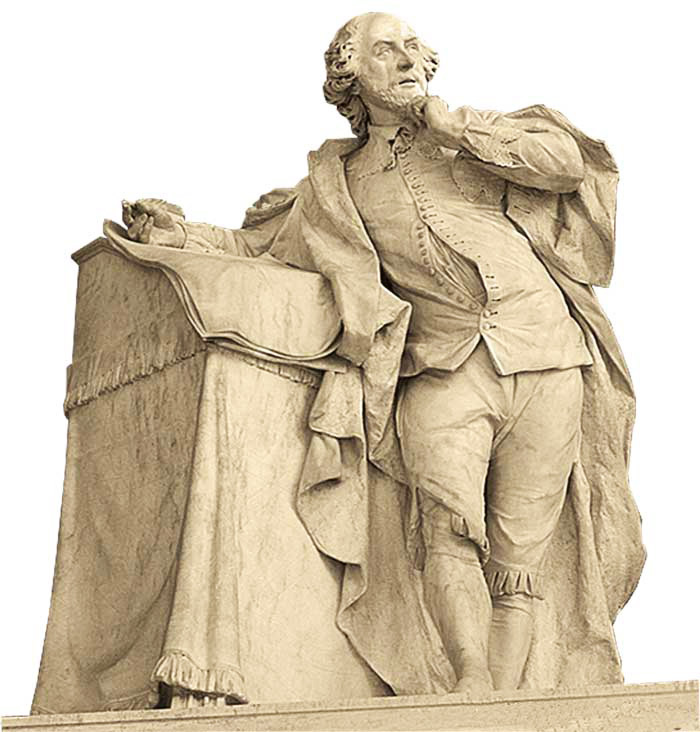 Garrick almost certainly posed for the statue himself – showing the Bard at the precise moment of inspiration. Completion of this commission was not without difficulties. The original version showed faint veins across the face (natural blemishes in the marble), which Garrick found unacceptable. Roubiliac had to remove the head and replace it with another of a purer marble. The original statue, bequeathed to the British Museum, is now in the British Library (without its plinth). The excellent copy now in the Temple was presented to the Temple Trust by the British Museum. In the Zoffany painting showing the Garricks resting in front of the Temple, the statue can be glimpsed through the open door of the building, reminding us of Garrick’s devotion to his idol. ‘David Garrick as Richard III’, William Hogarth, c.1745. Collection of Walker Art Gallery, Liverpool. A full size reproduction is displayed inside the temple. Garrick’s Lawn is the name of the garden beside the Thames that surrounds Garrick’s Temple to Shakespeare. Although there is no official record to prove it, it is widely believed that Lancelot “Capability” Brown advised David Garrick on how best to lay out the grounds of Garrick’s Villa. The gardens undoubtedly emulate the style for which Capability Brown became famous, and the Garricks certainly had the means and cultural understanding to adopt the newly fashionable landscape style as the main design option for their beautifully positioned gardens. Today the gardens are managed by the Parks and Open Spaces Department of Richmond upon Thames Council and their contractors, together with a group of Temple Volunteers. The intention is to retain the 18th century characteristics of the original garden whilst making this much loved riverside park relevant, useful and valuable for the local and wider community. Working from contemporary paintings, drawings and nursery lists, the garden has now been restored to echo its 18th Century layout, complete with the serpentine path reflecting William Hogarth’s ‘Line of beauty’. Most of the trees, shrubs and flowers featured now were also present in Garrick's garden and are a mixture of native British plants, old garden species and plants collected from overseas, particularly America. 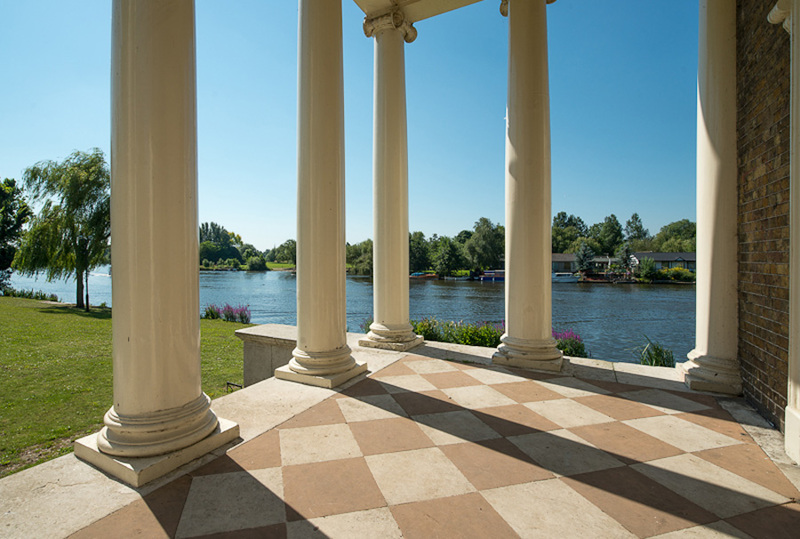 Above: The portico of Garrick’s Temple to Shakespeare looking downstream along the river Thames towards Taggs Island and Hampton Court Bridge. (Mark Goodman, www.moleseylife.co.uk). After Garrick’s death in 1779, the villa and the temple remained the property of his wife Eva until her death at the age of 98 in 1822. Thereafter the temple passed through a succession of owners until 1932 when it was purchased by Hampton Urban District Council. By the mid 1990s the Temple was in serious need of repair and the garden sadly neglected. After a campaign supported by a group of distinguished actors, The Temple Trust, The Hampton Riverside Trust, donations from local groups as well as a successful application by the Borough of Richmond upon Thames for money from the National Lottery's Heritage fund, it was restored in the late 1990s and reopened to the public as a museum and memorial to the life and career of Garrick. It is reputedly the world's only shrine to Shakespeare. Above: 'The Garden at Hampton House, with Mr and Mrs David Garrick Taking Tea’, Johan Zoffany,1762. 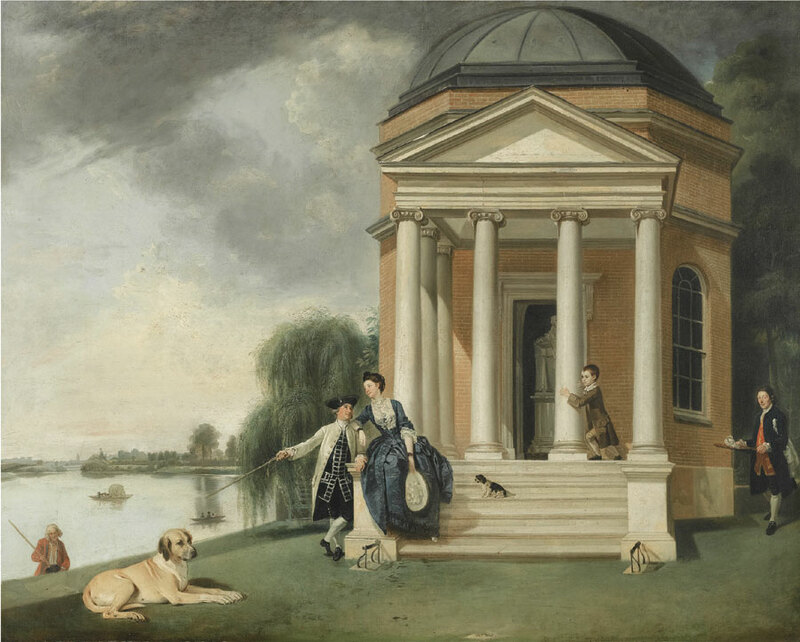 Below: 'The Shakespeare Temple at Hampton House, with Mr and Mrs David Garrick', Johan Zoffany,1762. Both paintings were bought at auction in 2011 by The Garrick Club, London. Full size reproductions are on permanent display inside the temple. Temple: Sunday afternoons (14.00-17.00) from Sunday 25th March to Sunday 28th October 2018. Garden: Daily throughout the year, 7.30am to dusk. Special group visits can be arranged at other times. A308 from Kingston via Hampton Court or from M3, Junction 1. Limited parking in nearby streets. The following buses stop close to the Temple at bus stop “Garrick Villa”. R68 Richmond to Hampton Court. To Hampton Court terminus, then walk or R68 bus. then walk or 111 or 216 bus to “Garrick Villa”. District Line to Richmond, then R68 to “Garrick Villa”. District Line to Wimbledon, then train and bus as above. The temple was built in the Classical style popularised by the Italian architect Palladio with an Ionic portico, four columns wide by three deep, flanking the entrance. Several steps lead up to the portico. The temple's architect is unknown as Garrick’s decision to build it is not recorded in his own papers. Robert Adam and Lancelot ‘Capability’ Brown have both been suggested as possibilities. An ‘Ionic Temple’ of similar design stands in the gardens of Chiswick House a few miles away. This may well have been the inspiration for Garrick's Temple, Garrick had spent his honeymoon in June of 1749 at Chiswick House, home of Lord and Lady Burlington. The Burlingtons were close friends of Garricks and had acted as guardians to Eva Maria (an Austrian ballet dancer) before the marriage. 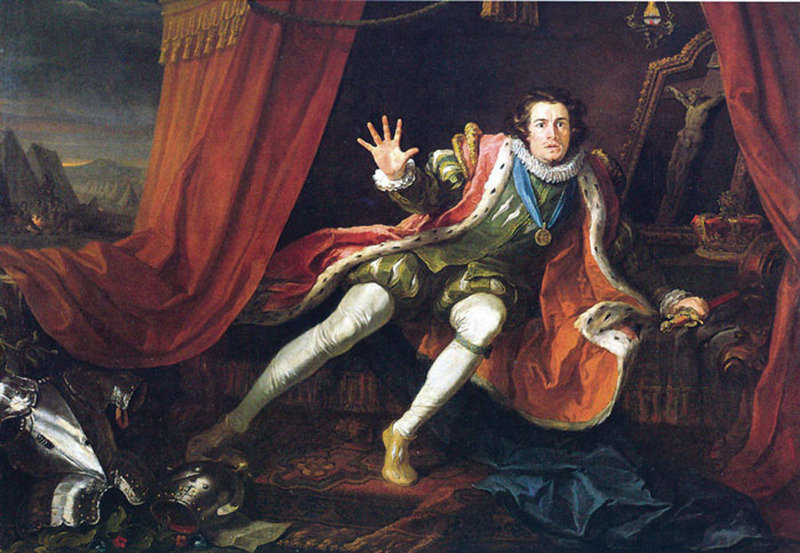 A full size reproduction of ‘David Garrick as Richard III’ by William Hogarth is displayed inside the temple. Garrick’s Lawn is the name of the garden on the Thames that surrounds Garrick’s Temple to Shakespeare. Although there is no official record to prove it, it is widely believed that Lancelot “Capability” Brown advised David Garrick on how best to lay out the grounds of Garrick’s Villa. The gardens undoubtedly emulate the style for which Capability Brown became famous, and the Garricks certainly had the means and cultural understanding to adopt the newly fashionable landscape style as the main design option for their beautifully positioned gardens. Today the gardens are managed by the Parks and Open Spaces Department of Richmond upon Thames Council and their contractors, together with a group of Temple Volunteers. The intention is to retain the 18th century characteristics of the original garden whilst making this much loved riverside park relevant, useful and valuable for the local and wider community. Working from contemporary paintings, drawings and nursery lists, the garden has now been restored to echo its 18th Century layout, complete with the serpentine path reflecting William Hogarth’s ‘Line of beauty’. Most of the trees, shrubs and flowers featured now were also present in Garrick's garden and are a mixture of native British plants, old garden species and plants collected from overseas, particularly America. 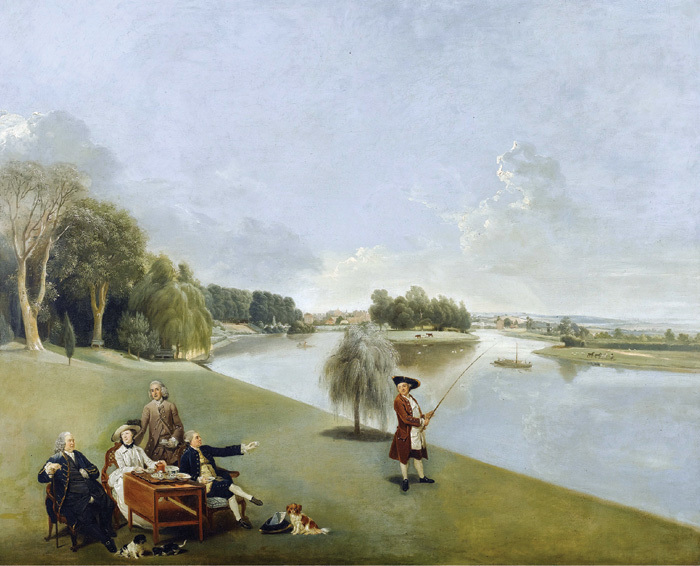 Above: 'The Garden at Hampton House, with Mr and Mrs David Garrick Taking Tea’, 1762. Below: 'The Shakespeare Temple at Hampton House, with Mr and Mrs David Garrick', 1762. These two paintings by Johan Zoffany were bought at auction in 2011 by The Garrick Club, London. Full size reproductions are on permanent display in the temple. Temple: Sunday afternoons (14.00-17.00) from Sunday 26th March to Sunday 29th October 2017. Patrons: Sir Geoffrey Cass, Michael Frayn, Bamber Gascoigne, Sir Derek Jacobi, Robert Pennant Jones, Sir Ian McKellen, Prunella Scales CBE, Claire Tomalin, Timothy West CBE. 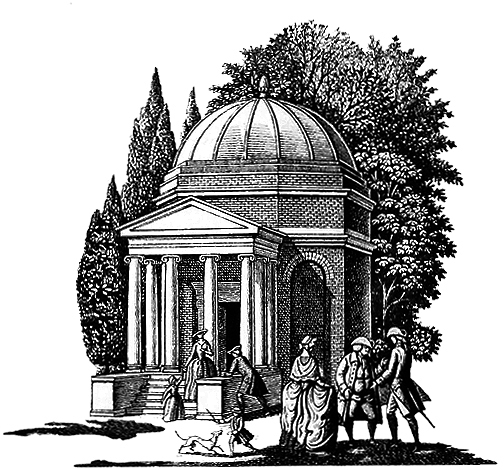 The line drawing of the temple in the banner is a detail from the drawing "Garrick's Temple of Shakespeare & Church at Hampton 1769" by Eric Fraser. Used here with the kind permission of Geoffrey Fraser. 'Temple in Snow and Sunshine', Lewis Lloyd. ‘Path leading to the Temple’, Mark Goodman (www.moleseylife.co.uk). ‘Marble statue of Shakepseare by Roubiliac’, photograph reproduced by the kind permission of Calotype46. © Garrick’s Temple to Shakespeare Trust.